Tyler Chow had a monster game for the Huskies in the Hardy Cup. 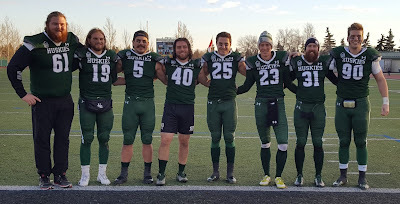 Tyler Chow saved his greatest homecoming game in his final U Sports football appearance in Calgary. Last Saturday, Chow had his most memorable game to date with the University of Saskatchewan Huskies. The star running back, who is in his fifth and final season with the Huskies, carried the ball 24 times for 222 yards and scored two touchdowns. 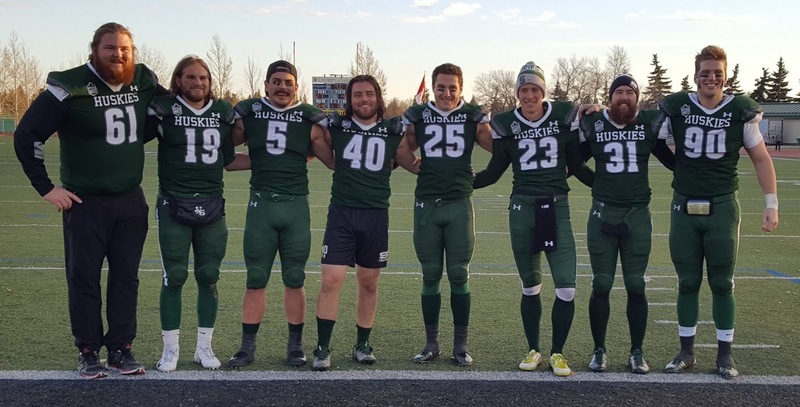 The alumnus of Calgary’s Notre Dame High School Pride football team hauled in two passes for 19 yards for the Huskies as well. Thanks to Chow’s efforts, the Huskies pulled off a huge 43-18 upset over the previously undefeated University of Calgary Dinos in the Canada West Conference championship game – the Hardy Cup at McMahon Stadium. The Huskies, who improved to 7-3 overall, claimed the Canada West title for the first time since 2006. The Dinos, who finished the campaign at 9-1 overall, were trying to win a third straight Canada West title and their ninth conference crown in the past 11 seasons before falling to the Huskies. Chow, who stand 5-foot-11 and weighs 195 pounds, thrilled a large contingent of family and friends he had in the crowd of 1,877. He had a touchdown on a one-yard run late in the second quarter to give the Huskies an 18-8 edge on the Dinos. With the Huskies holding a 25-18 edge, Chow had the game’s defining play running in a touchdown from 23 yards out just 91 seconds into the fourth quarter to give the Huskies a 32-18 lead. Tyler Chow was named a Canada West all-star this season. That started an 18-point surge for the Huskies to close the game. The surge was completed by a kickoff single from kicker Sean Stenger, a 42-yard field goal from Stenger and a one-yard touchdown run by Adam Machart. On Wednesday, Chow was named the U Sports offensive player of the week for his efforts against Calgary. Stenger took the U Sports special teams player of the week award making 2-of-3 field goals for the Huskies and averaging 41.5 yards on four punts landing one of those kicks inside the Dinos 20 yard line. Coming into this season, there were questions marks surrounding how effective Chow might be. He missed four games last season and was limited in four other contests due to a lower body injury. He carried the ball 100 times for 640 yards and scored two touchdowns to earn Canada West all-star honours and help the Huskies post a 5-3 regular season record in 2018. During his regular season career with the Huskies, Chow carried the ball 385 times for 2,372 yards and scored 13 touchdowns. Tyler Chow is the Huskies third all-time leading rusher. Doug Rozon is the Huskies all-time leading rusher piling up 4,086 yards playing from 1995 to 1999. Terry Eisler sits second on the Huskies’ all-time rushing list with 2428 yards playing in 1985 and 1987 to 1989. David Stevens rounds out the Huskies career top five rushing leaders with 2,276 yards playing from 2001 to 2005. Entering the 2018 post-season, Chow had never been part of a playoff win with the Huskies unlike the other four top five rushers in team history, who all had a hand in various playoffs runs that saw the Huskies reach the Vanier Cup. In Rozon’s case, he helped the Huskies win two Vanier Cups in 1996 and 1998 running behind an offensive line that contained a star named Scott Flory, who is now the Huskies head coach. Chow was able to dump the unwanted distinction of never being part of a playoff win on Nov. 3 in Vancouver, B.C., when he helped the Huskies post a 31-28 overtime upset victory over the University of British Columbia Thunderbirds. Tyler Chow scored two touchdowns in the Hardy Cup. In that contest, Chow had a solid outing grinding out 89 yards rushing on 21 carries and running home touchdowns from one and 16 yards out. He hauled in six passes for 54 yards to go along with his efforts on the ground. Combine that game with his efforts against the Dinos in a Canada West title winning game for the Huskies, Chow has created his own storied playoff run and has vaulted his name firmly into the conversation of who are the top all-time running backs in the history of the U of S football program. While the Huskies have pulled out two giant upsets at this point in the U Sports playoffs, they now face their greatest David versus Goliath match. The coming Saturday, the Huskies travel to London, Ont., to face the defending Vanier Cup champion University of Western Ontario Mustangs in the Mitchell Bowl, which is one of two U Sports semifinal playoff games. The Mitchell Bowl will be shown live at 3 p.m. Saskatchewan time on Sportsnet. The Universite Laval Rouge et Or (10-0) host the St. Francis Xavier University X-Men (8-2) in the other U Sports semifinal - the Uteck Bowl – also on Saturday in Quebec City, Quebec. The Mustangs enter their match with the Huskies ranked as the top rated team in the final U Sports Top 10 rankings and have won their last 22 games overall in a row. Tyler Chow and the Huskies fifth-year are having a memorable final run. Western’s last loss came back on Nov. 12, 2016 in the Yates Cup, which is the Ontario University Athletics conference championship game, to the Wilfred Laurier University Golden Hawks 43-40. The Mustangs led that contest 40-19 in the fourth quarter, before the Golden Hawks pulled out an incredible comeback. Western thumped the mighty Rouge et Or 39-17 in last year’s Vanier Cup. So far, Chow and the Huskies have shown the role of giant killer fits them just fine. It wouldn’t be a surprise to see Chow and the Huskies come up with another giant performance, and if they do, they might be heading to the Vanier Cup to be held on Nov. 24 in Quebec City, Quebec.